Dainik Haribhoomi,Raipur The Largest Circulated Hindi Newspaper From Chhattisgarh. The Basic Of Journallism eg. Reporting, Editing etc. Back To Chhattisgarh Again And Joined Dainik Bhaskar As News Editor To The Its Bilaspur Edition. Looking After Entire Edition. Joined Dainik Haribhoomi In 2004 As News Editor. 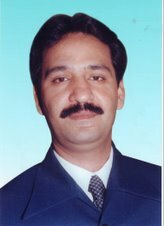 Promoted As Resident Editor In may, 2006. Also Worked As Reader, Journalism Faculty, Kushabhau Thakrey Patrakarita Vishwavidyalaya, Raipur For 6 Months. - Master Of Journalism And Mass Communication From Makhanlal chaturvedi Rashtriya Patrakarita Vishwavidyalaya, Bhopal. 1. Hundred Of Articles Havebeen Published In Diffrent Newspapers And Magzines Nation wide. 2. Five Books Havebeen Published, tittle: Shawak, Es Suchna Samar Men, Mat Puch Hua Kya-Kya, Serweshwar Dayal Sexena Aur Unki Patrkarita And Surkhiyan. Shri Arjun Singh Abhinandan Granth : Seva Aur Samarpan Ki Ardhshati.